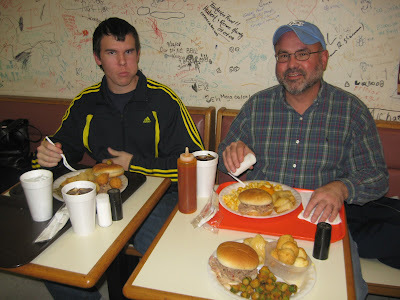 My younger son and his dad had been wanting to go to Backyard Barbecue Pit after the older kid and I went there and had a great real wood smoked barbecue sandwich and real home cooked Southern sides. Since, West Rowan High School was playing in the state championship football game (and won - yay), and we were headed up to Raleigh, we timed it for a dinner stop at Backyard BBQ in Durham, NC. Even though this was only a second visit with it being a long drive (but worth it) to Backyard Barbecue Pit, we felt like family this time. Backyard is the kind of North Carolina barbecue joint where you get treated right no matter who you are and can be a "regular" if you come back again. I was glad I took my other guys back to check out this NC barbecue place, because they thought it rocked too - just as I expected. The guys had full plates as you can see. They are very generous on the portions at Backyard Barbecue. And, the prices are super. A pork barbecue sandwich with two sides runs just $4.99, and frankly I'd raise that if I ran this place. Other plates are a little higher, but you can see that you get plenty to eat. Plus, it's all good eating. While most wood burning barbecue restaurants just do whole hog or barbecue shoulder, Backyard does shoulder plus chicken and ribs also in the wood smoker. And, they fry up some fish which I really must try. It looks wonderful, but I'm such a barbecue girl that it's hard to pass on real deal que. We were in late and after dark, so here's what to look for. You're just three lights off I40 in Durham. I would say that you can't miss it, but I have missed places when folks tell me that. Really though, the sign is easy to see, and the white building and the lights are easy to see. 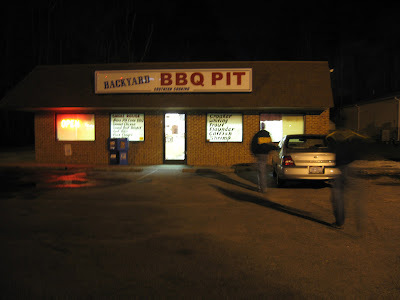 Backyard BBQ has a second location open now on Guess Road, but I've not been there. We are always coming in from Chapel Hill off I40, so we hit the main stop here. It's maybe a 15 minute drive - definately not far from UNC. So - here is what you missed (-: My plate is the barbecue sandwich which is stacked high. 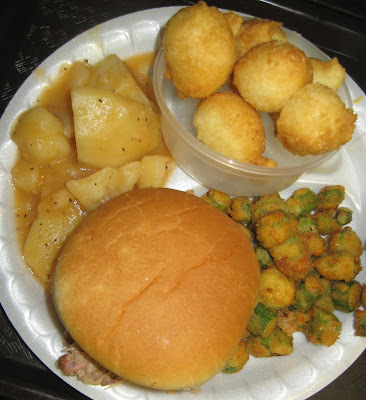 The sides are the white potatoes which are like my Grandma used to make (kind of with a sauce) and fried okra (which I adore and which my guys have never warmed up to). 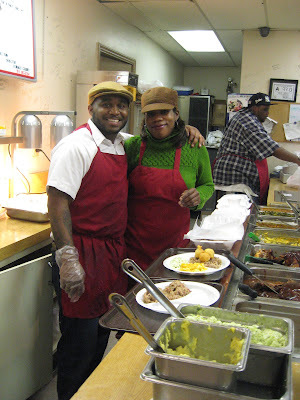 Last time, I had the Brunswick stew and the collard green, and both of those were yummy. The guys also had macaroni and cheese and said it's great. Bless my Southern self; I do not like mac and cheese. Don't tell that. I might get run out of North Carolina. The kid also had green beans and liked those. I'll have to give those a try. They have so many sides that it is hard to pick. I would also note that the fried items are dropped fresh and not out on the line. If you want French fries or fried okra, you just say. They make those fresh, so they are never limp and greasy. The desserts at Backyard Barbecue look wonderful too, but I've not had room to eat any yet. That pecan pie on top of the counter was calling my name this time. It looked like the ones my Momma makes. Yum. I may have to get carry out on dessert some day (when not road tripping), because Backyard Barbecue always fills me up and on a dime. I sure wish I lived closer, but this barbecue joint would wreck my diet and waistline for sure. I'm glad I go out I40 from time to time though, and I do like to time it so that I can eat here. It's hard to find wood smoked barbecue and home cooked sides. Add in that friendly service, and this is a thumbs way up.